District faculty and administration in New Canaan, Conn. met on Dec. 11, 2017 at the high school to discuss next year's budget goals, including a proposed alternative high school. 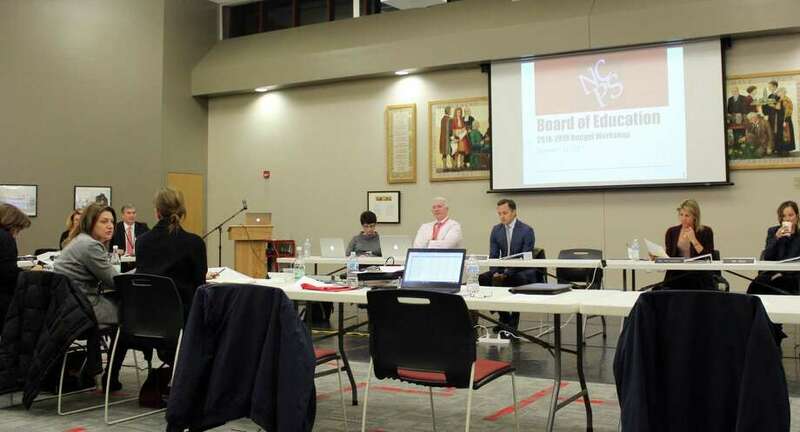 NEW CANAAN — While the schools are eyeing a conservative budget for next fiscal year, a few new initiatives — most notably in the form of a proposed alternative high school program — have made the wish list. New Canaan High School Principal Bill Egan, along with Darlene Pianka, assistant superintendent of pupil services, presented the idea of the alternative high school to district administration and the Board of Education during a budget workshop Dec. 11. The district currently has an after-school instructional program (AIP) for upperclassmen at the high school who struggle academically during the school day. There are currently five to six students enrolled in this program. Egan said the alternative high school would not only be a day program, but add a therapeutic component that many students need. A committee dedicated to the program studied other outplacement programs, including a program in Ridgefield to help develop a customized alternative concept for New Canaan. The proposed alternative school would also have a flexible academic schedule for both general and special needs students at all high school grade levels. Pianka said students would also be able to transition from the alternative program back into the mainstream program as they felt fit. “One of the things we feel students may need is flexibility to be able to return,” she said. According to Egan and Pianka’s presentation, the school would be for students with mood disorders and medical issues impacting their mental health. This includes students with anxiety, depression, post-traumatic stress disorder and bipolar disorder. The program would also be open to students who have just been released from inpatient treatment for eating disorders and substance abuse issues. Pianka added there are students in the district with school avoidance issues and with medical issues that make a regular school day difficult. The alternative program would be open to them as well. The district is proposing beginning the program with eight to 10 students and then increasing to 10 to 12 as the school year goes on. They hope the program would bring in at least two to three students currently placed outside the district. The school, which would be housed at the former Outback Teen Center, would need one general education teacher in total (.2 FTE per core area). It would also need a psychologist or social worker, a special education teacher and a non-certified teaching assistant. The funding from this would come from existing staff. Nursing, guidance and administrative needs would also be met through current district staffing. While no exact cost was mentioned during the meeting, Pianka said the program would use the $80,000 offset from the elimination of the AIP program. The alternative program would also save the district money in outplacement tuition. Costs of the program would include upgrades to the Outback, the purchase of new technology and equipment and custodial services for the new facility. Superintendent Bryan Luizzi offered his endorsement of the program.